The holiday season is one of my favorite seasons of the year. While many people rail against the Christmas paraphernalia littering the supermarkets and grocery stores and the Christmas music playing on the radio, even though it is not even Thanksgiving yet, I am one of those people who believes Christmas cannot come soon enough. I love Christmas for the truth and story behind it, the celebration of our Savior humbling himself and taking on flesh to know our pain and become a merciful and faithful high priest to make propitiation for our sins. I love it for the warmth it brings into the cold winter season, for the smell of pine and evergreen it brings into the home, and I love how this holiday prompts families and friends to come together and celebrate. For the past couple of months I have been involved in a local theatre production of Charles Dickens’ A Christmas Carol. I love this story and this play for so many reasons, for the beautiful redemption and salvation of Ebenezer Scrooge and for the many wonderful memories associated with this play. Needless to say I could not have chosen a better way to anticipate the Christmas season. This story tugs on all the heart strings. It is full of laughter and merriment, loss and tragedy, family, love, and redemption. Dickens provides a mirror for all of humanity in the character of Ebenezer Scrooge. He prompts us to solemnly consider our past, present, and future and to learn the lessons they teach us. Over the past few weeks I have thought hard about what it means to keep Christmas in my heart all year long. I have thought of how all of us have ghosts in our lives, ghosts and regrets from the past, and how we so often fail to learn from our ghosts. What are the regrets we have from the past? And what ought we to learn from those? What is the trajectory of our future? Where is our current path, our present, leading us? My baby brother Calvin has been the virtual equivalent of Tiny Tim in my family. Thanks to his immune deficiency, he combatted juvenile arthritis when he was six years old and was diagnosed with Crohn’s disease when he was eleven. I remember the holidays when he was hobbling around on his stiff painful joints with the help of his walker, the months when he was connected to a feeding tube when his Crohn’s disease viciously flared up, and all the many times his life was completely uncertain, seemingly hanging by a feeble thread. Approximately three years ago, the Christmas of 2013, my family was hurting from the fresh wound of the unexpected loss of our dear son and brother. But it wasn't our Tiny Tim that we lost. It was my brother Ben who was seventeen years old at the time, strong, healthy, on the verge of graduating high school, and full of ambition. Our loss seemed even more starkly painful during the season of Christmas, because Ben was always the one who navigated the holidays with all of the enthusiasm and energy that came so naturally and easy to him. We always said when Ben was gone from the house, it seemed radically quiet. And despite all of the people who were there that Christmas, it was still painfully quiet without Ben. Many of my best memories of Ben come from the holidays—Valentine’s Day when my brothers and dad woke up extra early to prepare breakfast for all of us—Thanksgiving when Ben took it upon himself to fix all our broken cars and be the main server at the family dinner table—Christmas when Ben made sure to always find the largest Christmas tree imaginable, spent arduous hours of labor untangling all our old Christmas lights, and baked pans of Gingerbread men and decorated them all with a unique personality and character. Celebrating Christmas the year he died—celebrating anything—seemed nigh impossible. But our family came together nonetheless, a matter of days following my brother’s funeral, and we kept Christmas. The days following my brother’s death, I remember my father encouraging all of us to stay close to one another, nobody be alone for too long. As much as I love my family, it was hard to be with them after Ben died. For about a year it seemed every time we came together was a painful reminder of Ben’s absence. But we did all the same. We kept coming together, kept attending worship together, kept celebrating the holidays together. And slowly we started to heal. Last year my oldest sister Elizabeth got married. My sister’s wedding was one of the most beautiful I have ever seen and the most festive I have attended. The whole world was in a mood to celebrate already, thanks to the holiday season, and it felt right contributing to the festivities with a wedding. There was so much mistletoe left over from the wedding and my family took it all and littered our Christmas celebration with it the following week. My sister hung the mistletoe in the house and stuffed everyone’s stocking with it, a sweet representation of how much love our whole family seemed to be bursting with that year. This year my now fifteen-year-old brother Calvin towers over me, approximately 6’ tall and growing fast. He is strong and healthy and none of us really expected him to come this far but thanks to modern medication and the good providence of God, here he is. Three years ago we lost our young, energetic, and ambitious brother and since then we have gained a son-in-law, a granddaughter and grandson, a baby-on-the-way, and a son-in-law-to-be (my sister Ruth got engaged!). Our family seems to be growing exponentially. Yes, life is a strange, beautiful mixture of victory, loss, joy, and sorrow. Perhaps this is why the Christmas season is important to me. It has always served as a gauge in my life for where I have been and how far I have come and it has always been a reminder of everything that is most important in my life—or more like, everyone who is most important. It is a time to remember the ghosts of my past, the beauty and joy of the present, and to take into careful consideration my future and the trajectory of my life. Do you celebrate Christmas? Thanksgiving? If so, how and why? What are some things you love about this season of the year? Share in the comments below! This was beautiful to read. What incredible blessings have come your way in three years time. Thanks for sharing. 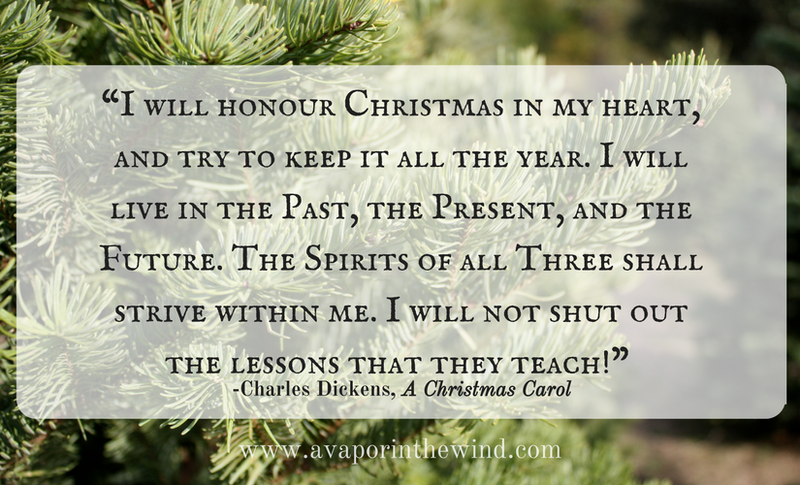 I am enjoying reading A Christmas Carol for the first time.